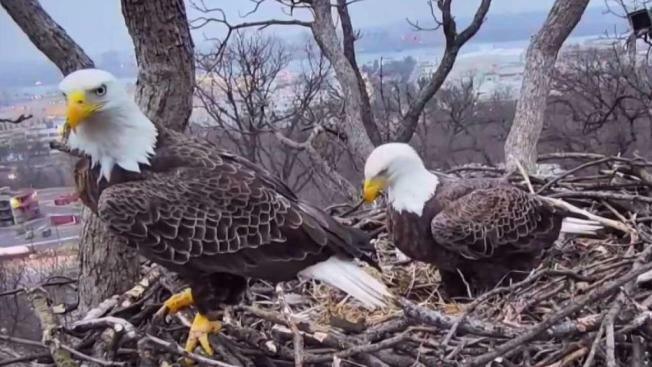 A high drama is unfolding in the nest of Liberty and Justice, two bald eagles who have hatched several eaglets above the police academy in Southwest D.C. over the last 15 years. Justice, the male eagle, has been missing since last Saturday. With two dueling suitors, the dissolution of a successful, long-term relationship and two eggs in the nest, it’s unclear how the bird family at the center of this Shakespearean drama will fare. Rapacious raptor watchers were already tuned in this week. Liberty mated with Justice in January and laid her first egg days after his disappearance, and a second egg on Saturday evening. But the plot thickened only hours after Justice was last spotted; a male intruder dubbed Aaron Burrd started poking around the nest. He was still hanging around Tuesday, when Liberty laid the season’s first egg. Aaron Burrd was first seen in the nest on Sunday, and made an appearance Monday looking rough, with "banged-up feet," one eagle-watcher recorded. Eagles typically mate for life, and Liberty and Justice have raised many eaglets successfully over their 15 years together. But with the population growing under the tutelage of conservation efforts, it’s more common to see eagles dueling for mates. It’s very possible that Aaron Burrd defeated Justice in an off-screen battle. "We think part of the reason why justice is now gone, once an eagle gets beat they will leave the territory," Tommy Lawrence, Managing Director of the Earth Conservation Corps, said. "Justice was comfortable. He hasn’t had much competition." "He got lazy and wasn’t prepared for this kind of younger eagle coming in," Lawrence continued. 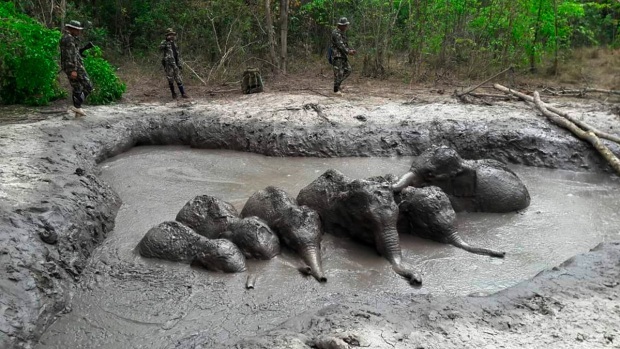 The Earth Conservation Corps, an organization that helps maintain the camera, went out searching for Justice. They found no trace — which Lawrence said is good news because it means one of D.C.’s favorite eagles likely wasn’t hurt or killed. It’s bad news for anyone that feels invested in Liberty and Justice’s family. Male eagles have returned to their nests up to two weeks after leaving, so Liberty-Justice fans can hold onto hope. Some people who went into an abandoned Houston home to smoke marijuana found a caged tiger, police say. 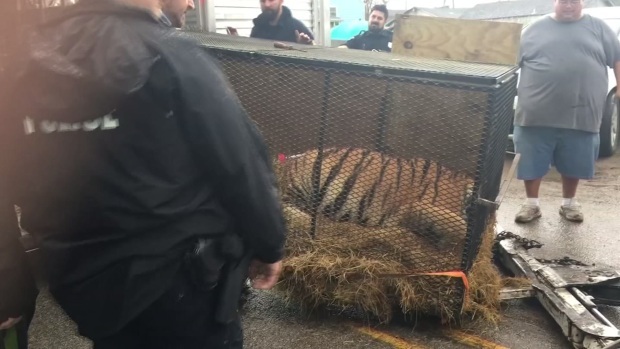 Houston's major offender animal cruelty unit and animal shelter volunteers were called in to care for the tiger. Just because Aaron Burrd may have chased off Justice, doesn’t mean he gets Liberty. He still has to court Liberty — and apparently now, fend off another male, called M2, who has appeared by the nest. “He’s not the best at it. He’s coming in at random times. However, he’s going through the normal process that eagles do to prepare for eggs," Lawrence said. After Liberty laid her second egg, Aaron Burrd visited the nest, and Liberty started to show some signs of acceptance, "showing him the ropes of being a father," Lawrence later wrote in an email. The new male still definitely poses a risk to the eaglets: New males aren’t receptive to others' eggs and could destroy them. So far, though, Aaron Burrd hasn't paid much attention to the eggs. And without a companion, Liberty has been forced to leave the egg exposed as she hunts for food. While this tale of love, loss, betrayal and duels over a woman lends itself to a big-screen adaptation, it also provides an opportunity for learning. “Whatever happens, it’s new science we can learn from these eagles,” Lawrence said. You can watch the Eaglecam livestream below. Lawrence noted a few things you can watch out for: If Liberty is shaking her tail, she’s being aggressive. If she’s hovering, she’s protecting her egg. If she’s calling out, she’s warning her ribald suitors to stay away.